If you roll your own, you need a shredder to break up your herbs. 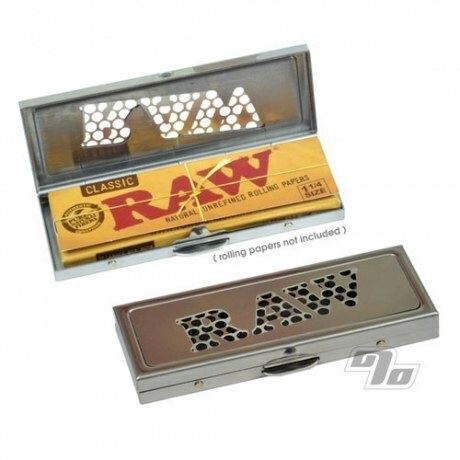 Now RAW has gone and combined a shredder with a cool rolling paper case for your favorite 1 1/4 size RAW Rolling Paper packs. There's no easy way to roll a quality joint out of whole flowers. If you're out and away from your normal grinder, this shredder can be a life saver to a roll-your-own enthusiast. RAW provides a convenient and stylish way to not only protect your pack of 1 1/4 size RAW Rolling Papers but keep your shredder with you at all times. The RAW Shredder case easily slips into your pocket. Not only are these handy and convenient but they are also dishwasher safe! Definite must for anyone that rolls their own on the road. 1 1/4 Rolling Paper sized sized at 3.25x1.25in. Pop your favorite RAW 1 1/4 pack in on the go and pop it out when ready to shred. No spillage. This is really a nifty little pocket shredder to keep around, less bulky than a grinder and I can easily store my papers in it too. Plus it just looks Awesome, 10 out of 10! This is way better than a grinder. It grates a lot finer than a grinder. My only complaint is that you need to be careful of particles flying everywhere while shredding. This thing is built like a tank. I would recommend using the grinder on this for emergencies but the protective case alone is worth it. This is great especially when your on the go. The shredder works ok. its great to use as a case once you use to grind stuff there will be residue left in the case. I like this because it "catches" the shreddings, such as they are. However, once you use it for that, it makes it not so good for carrying papers in after. It works for on the fly, but i agree much better to shred ahead with a decent grinder.